Homemade Croissants has been on my wish list for a very long time and they were also the most postponed one considering the lengthy procedure. If not for the easy croissant recipe with the step wise instructions and the amount of discussions all the bakers of the We Knead to Bake group had, I seriously would not have considered to give this a shot. They turned out to be the best buttery, flaky croissants that we get in the bakeries. So crisp and crunchy the croissants turned out to be that I might actually ignore the quantity of butter that went into these french croissants and start enjoying them for breakfast every day. 1. Combine both milk and water in a bowl and drop the ice cubes and keep aside. 2. Combine all the dry ingredients in another mixing bowl. Discard any thin ice cubes floating on top and add it to the dry ingredients. I mixed and made the dough using my hand, but you can use your hand mixer with the dough hooks or your food processor. 3. Lightly dust a 10-inch pan or a dinner plate with flour. Place the ball into the pan and press the dough down gently. Lightly dust the top also with flour to prevent the dough from drying out. I placed the pan into a plastic cover and covered it with the lid. Fold the extra protruding sheet below the pan and refrigerate it overnight. 4. On the next day, cut out 2 pieces of parchment or waxed paper into 10” squares each. 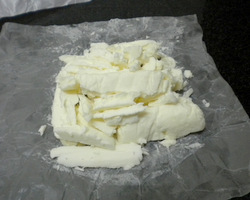 Cut the cold butter into 1/2-inch-thick slabs or into cubes. Arrange these pieces on one piece of parchment/ waxed paper so that they form a 5- to 6-inch square (roughly). Place the other piece of paper on top. (Shown above). 5. With the help of a rolling pin, pound the butter very gently. They first start to become sticky and now use more force to pound it till it becomes flat forming a square of 7-1/2 to 8 inches approx. Trim the edges of the butter to make a neat square. Put the trimmings on top of the square and pound them in lightly with the rolling pin (Shown above). Place the whole set up in the refrigerator till we get the dough ready. 6. Take the dough out of the pan and meanwhile, prepare your work area by dusting with flour. Roll it out to a 10-1/2-inch square approx., and brush off any excess flour. 7. Take the butter out from the refrigerator and check if it cold. But it should be pliable also. If its not then refrigerate it again. This is to ensure that the the butter does not melt when we roll out the dough. If the butter is soft, it will melt, if it hard, it will break. 8. Peel the cover off the butter and place it in the middle of the rolled out dough so that it forms a diamond shape. (Shown above). 9. We are going to make an envelope of the dough by folding the edges around over the butter. (Shown above). Gently press the edges together so that the butter is completely sealed inside the dough. This is to make sure that the butter does not leak out on rolling later. 10. Dust the work area lightly with flour. 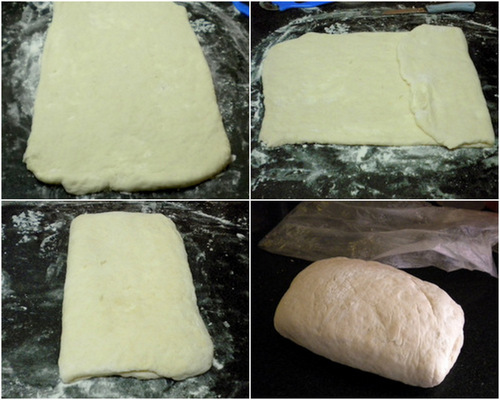 Using a rolling pin roll the dough and while elongating it slightly roll out further forming a rectangle of 8″x 24″. While rolling keep patting the sides with your palm to maintain the rectangle shape. 11. 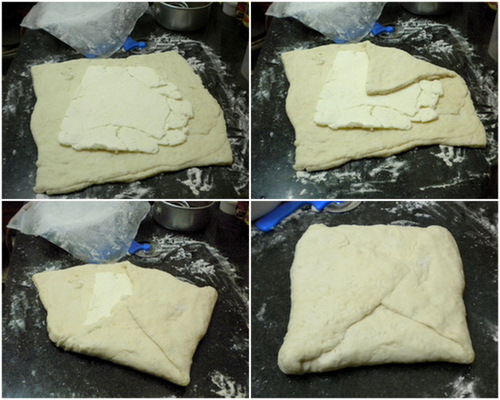 Make a mark, dividing the length of the dough by 3 along its length. Bring one corner of the dough end to the middle part and the other end to the middle overlapping the first fold. (Shown above). 12. 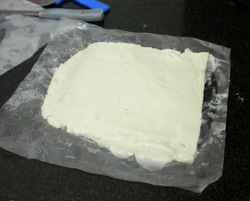 Place the folded into a plastic cover and freeze for 15 to 20 minutes. Take out the dough and repeat the steps 10 and 11. Cover once again with plastic cover and freeze for another 15 to 20 minutes. Once again repeat steps 10 and 11. 13. By now we would have rolled, folded and refrigerated 3 times leaving a time gap of 15-20 minutes in between every repeat. 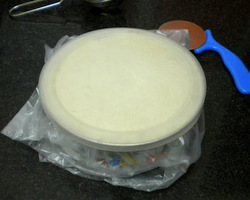 Now place the folded dough into a plastic cover and closing its mouth firmly to prevent drying out and refrigerate overnight. 14. 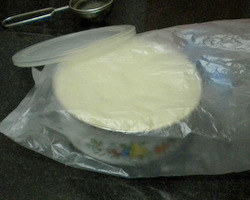 The next day, take the dough out of the cover. Dust the work area with flour. Cut the dough along the longer side into 2 halves. Place one half into the plastic cover and refrigerate it while we work with the other half. 15. 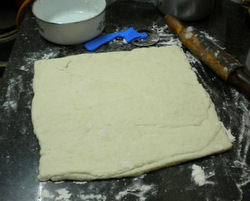 Using a rolling pin, gently but firmly press along the dough’s length once again making a rectangle of 8 x 22 inches. Use more flour for dusting if the dough is sticky. Trim the edges to make a perfect rectangle with straight sides. 16. With the help of a sharp knife or a pizza cutter, make marks at 5-inch intervals along the length of the dough. 17. 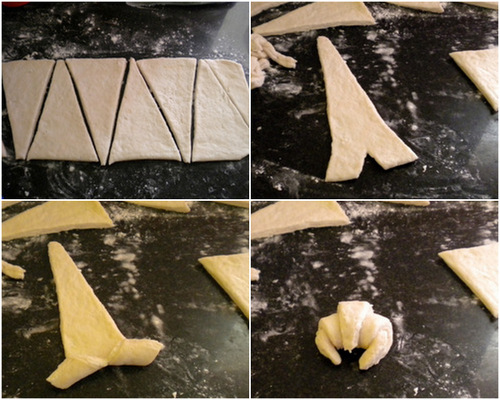 Make diagonal cuts as you would do for making crescents thereby forming a triangle (Shown above). 18. 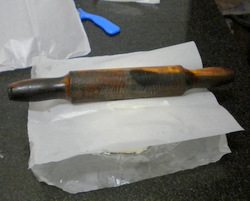 Roll the rolling pin over one piece thereby elongating it. Using a sharp knife, make a 1/2″ – 3/4″ length notch at the base of each triangle. 19. Spread your fingers and just roll from the notched (base) end to the tip of the triangle firmly but take care not to roll them tightly. (Shown above). Bring the ends together like shown in the above picture. Prepare all the triangles into croissants. Line them on a greased baking tray leaving enough space between them as they do rise a bit. 20. For making Pain au Chocolat, cut the dough into 5 inch length rectangle strips and place chocolate at one end and roll the dough strip firmly to the other end as you would do with a mattress. Gently press the end into the dough and place them on the sheet with the sealed side facing down. 21. Brush the top of the croissants with either milk or cream or a mixture of both. You can give an egg wash by mixing 1 egg with 1 tsp of water and use it to brush the top. 22. Refrigerate the remaining wash prepared as we have brush the croissants again before baking. 23. Place the croissants in a cool place and let it proof for 2-3 hours. They may not double up in size upon proofing, but you can see that they had become somewhat bigger in size. 24. Preheat the oven at 200 C (400 F). Meanwhile brush the top with wash mixture. Bake for about 15 to 20 minutes or till they’re done and they appear golden brown on top. Cool the croissants on the baking tray over a wire rack. Serve warm. 1. At all steps make sure that you are firm, yet gentle with the dough. 2. Take care not to knead the dough tightly and hard. 3. 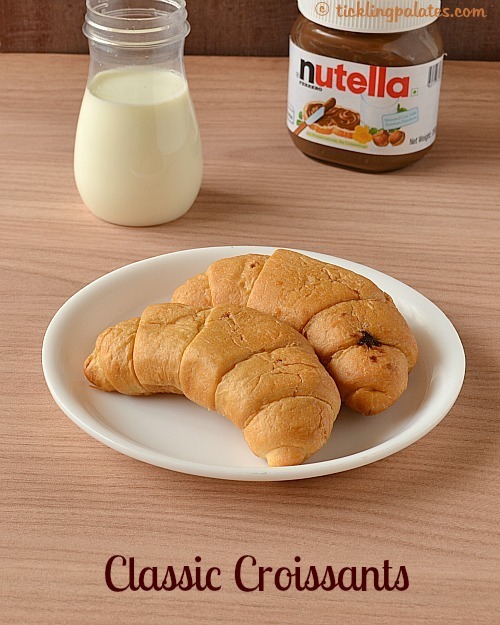 You can also fill the croissants with either Nutella or chocolate before proofing them. This is off to the We Knead to Bake. I have always wanted to try making croissants too. Yours look perfect! I think you had given me the courage to try making them! 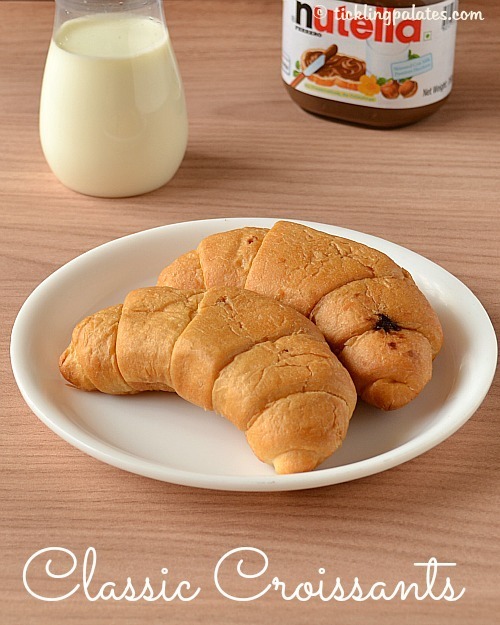 Awesome!Croissants looks so perfect and flaky..lovely presentation.wonderful post!! 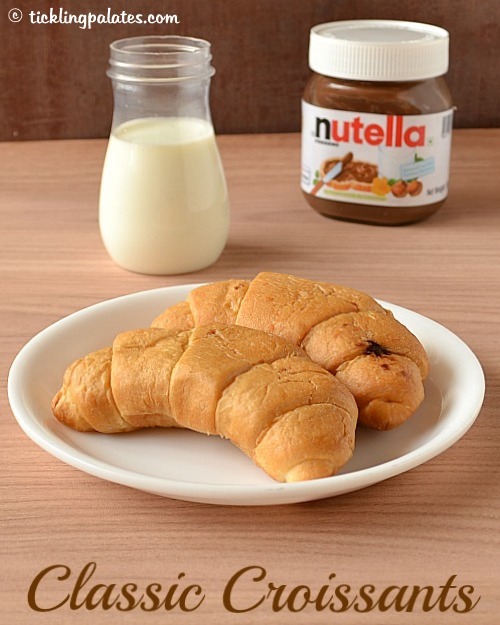 Perfect Croissants for a perfect breakfast.